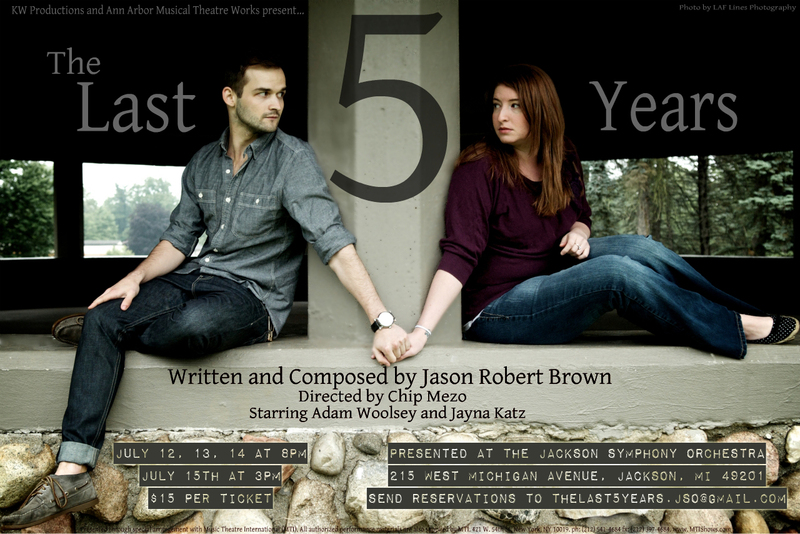 Those explosions you heard over downtown Jackson the last couple nights have been caused by Jayna Katz and Adam Woolsey blowing the roof off of the Jackson Symphony Orchestra performance space during The Last 5 Years, the Jason Robert Brown two-person musical. Telling the story of a meeting, a wedding, and a breakup (hers from end to beginning, his from beginning to end), the song-cycle musical is a cult favorite of musical theater folks and a standard repertoire piece across the country. KW Productions/Ann Arbor Musical Theater Works does a spectacular job with their presentation. Performing in the lovely JSO space, the production brings the story to emotional life, backed up by an ever-present orchestra stage center (and they sound superb. Kudos also to sound engineers KJ Rowan and Amanda Mahoney). Conductor/Pianist Lora Knight and her ensemble make beautiful music together. Artistic director Chip Mezo keeps the affair moving at a swift pace (90 minutes without an intermission) but the true stars of the show are Jayna Katz and Adam Woolsey, who infuse this powder-keg of songs with enough energy to lift the roof. Its hard to review either performance individually because they are so interdependent on each other — and what they achieve here is spectacular: lilting ballads, bitter drama, and soaring emotion. Jayna has a strong background in musical theater and this performance sends her off to her move to Chicago in spectacular style. Adam has performed locally and in NYC, and was a contestant on American Idol Season 11. Together, they are a force to reckon with, and you should not miss it. The near-sold out audience leapt to its feet at the conclusion of the show: and if you plan on seeing it, call your reservations in right now…the theater space is small and tickets will surely be gobbled up fast. Word of mouth is spreading like wildfire. Let me put it in print — do not miss this production. Catch the fireworks two more times: Saturday night July 14th at 8:00, and Sunday the 15th at 3:00. Tickets can be reserved by emailing thelast5years.jso@gmail.com. Tickets are 15.00 at the door. JSO is located at 215 W. Michigan Avenue, downtown Jackson, MI. For you Ann Arborites, thats a short 35 minute drive.